Transcript of Harald Eia’s talk at TEDxOslo. That’s the question I asked my professor when I studied sociology in the early ‘90s, because he was having a lecture about social democracies, Scandinavian welfare state, and he was a classical left-wing sociology professor. And he could not hide his enthusiasm when he talked about these egalitarian societies with no rich people and no poor people. But I, on the other hand, I was writing my master thesis about rich people. So when I interviewed my informants from the upper classes, they all said the same thing: life in Scandinavia is tough. We have to work twice as hard to earn money, because we have to struggle against high taxes, strong unions controlling the wages and a generous welfare state that makes people lazy. As one rich guy told me, he said they call it a social security net. Well, I call it hammock. And as every aspiring social scientists, I had — starting to go native, I started to feel sympathy for these rich people. And that’s why I raised my hand and asked my professor: well, what if you don’t care so much about equality, what if your dream is to become rich, where in the world should I have been born to become really rich? And that was a good answer and the best guess we had back then, that is until I visited the Professor of Economics Kalle Moeneat the University of Oslo who actually had checked the facts and answered the question: where in the world is it easiest to get rich? And before I share with you where you should go to earn money, we have to define rich. The UN talks about the poverty line, you know, if you earn less than $1 a day, maybe $2 a day, but we have to define the richness line, it’s a more fun line actually. And the most reliable report when it comes to rich people, The Wealth Report (2014), sets the richness line at individuals with net worth more than $30 million. In the consultant jargon, these people are called UHNWs, that is ultra-high-net worth individuals. So according to The Wealth Report, there are more than 170,000 UHNWs in the world and here’s the top five list of countries with most rich people. Number five, China with more than 8,000; UK, Germany, Japan, and on top of course United States with more than 40,000 rich people. But of course, we’re not interested in the absolute numbers here. We are interested in rich people per capita per million inhabitants. And if we leave out the pure tax havens, like Cyprus and Switzerland, Hong Kong, Singapore, Monaco, who have an artificially huge share of rich people, it turns out that we have on number five Denmark with 179 rich people per million inhabitants; Canada, New Zealand, Sweden, and on top Norway. But where’s the US? On place 13. So what happened to my old professor’s idea that “there are no rich people in social democracies”? But okay, $30 million, that’s pocket money in a country like the US where people can get insanely rich. So let’s raise the richness line up from $30 million up to $1 billion. And the most reliable source here is the Forbes Billionaires List and according to the Forbes, if you look at billionaires per million inhabitants, on number five, Germany 1.2 billionaires per million inhabitants; United States 1.7, Norway 2, Sweden 2.4, and on top Iceland with 3.1, with a single billionaire Thor Bjorgolfsson. The big mystery is how can this be: how can Bernie Sanders’ dream societies, socialist paradises, be such a breeding place for rich people? That’s a mystery. There are two reasons. Reason number one is free education. Social democracies give free higher education to everybody – cheap student loans and grants enables more people to use their talents and earn money. We can see this in the social mobility numbers. Imagine all fathers in a society and we divide them into five groups based on income from the bottom fifth up to the top fifth. And then we look at their sons and then divide their income into five groups, and we see how many sons of the fathers from the bottom income end up on top, how many sons go from rags to riches? 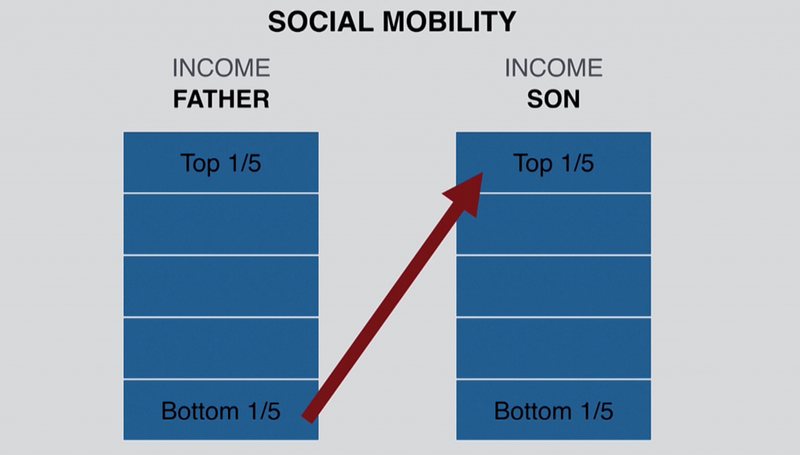 If it was perfect social mobility, if the talents and opportunities were equally distributed, 20% from the bottom would end up on each of these five ladders. So let’s look at the numbers for the different countries. 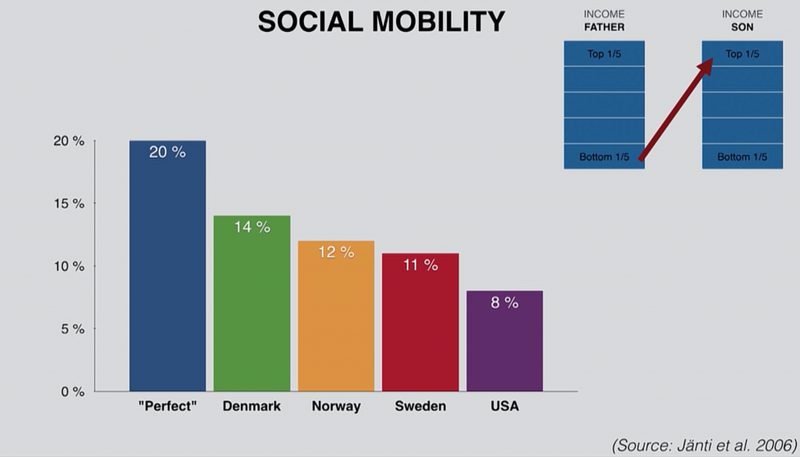 In Denmark, they’re pretty close to perfect social mobility with 14%, going from rags to riches; in Norway 12%, Sweden 11%, United States 8%. Because of free education there are more self-made men in Scandinavia than in the US. And if we look at those sons who don’t end up on top but stay on the bottom, go from rags to rags. 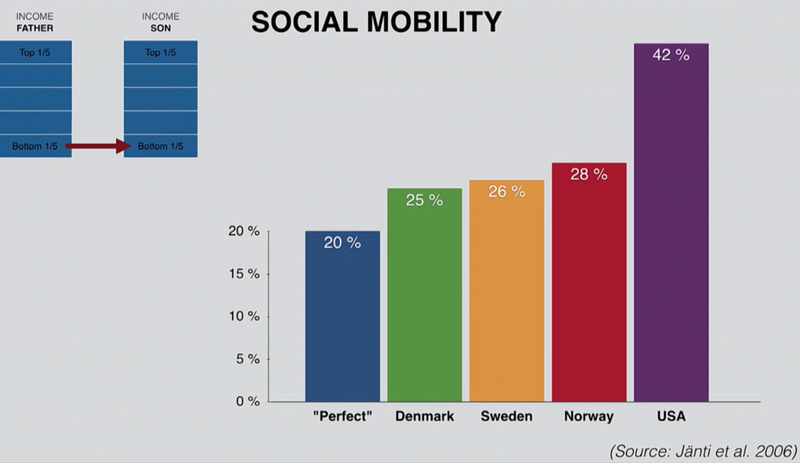 Again 20% will be perfect mobility, in Denmark 25% ends up on the bottom. This is because education in United States is very expensive. 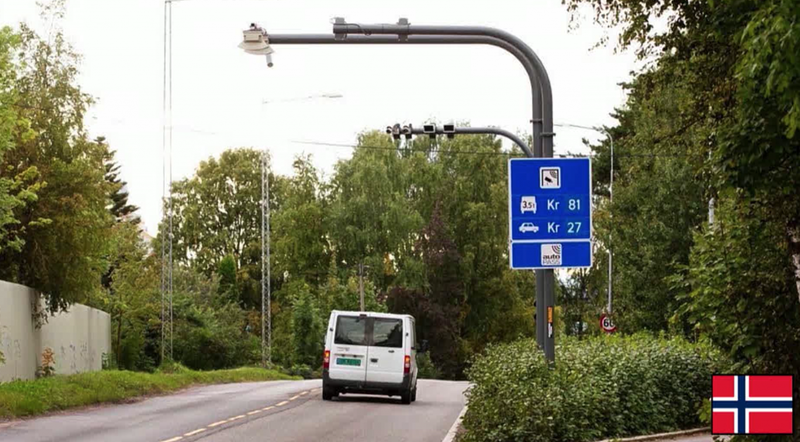 But the second and most important explanation for Scandinavia being such a breeding place for rich people is this: have you ever noticed if you’ve been to the United States when you drive through a toll plaza, there’s actually people sitting there taking your money. Compare that to my local toll plaza, just a sign with some gizmo attached to it. And when you go to a supermarket in the United States there are actually people there helping pack your things into your bags. It’s very friendly and convenient compared to my local grocery store, like this. Nobody there. And the biggest shock I had when I went to the US for the first time and went to the restroom there are actually people working there. 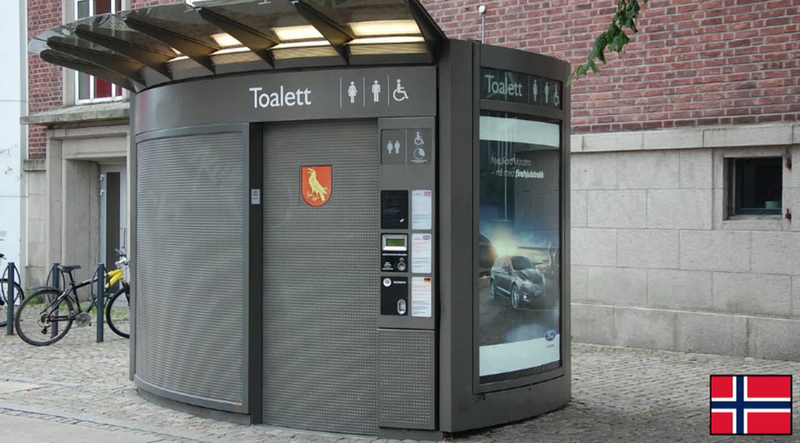 Compare that to my local public toilet, there’s not even a cleaner there. It cleans itself automatically. And the reason for this difference is that Scandinavian unions are pressing up the minimum wages, so it’s so expensive to have these people working there. 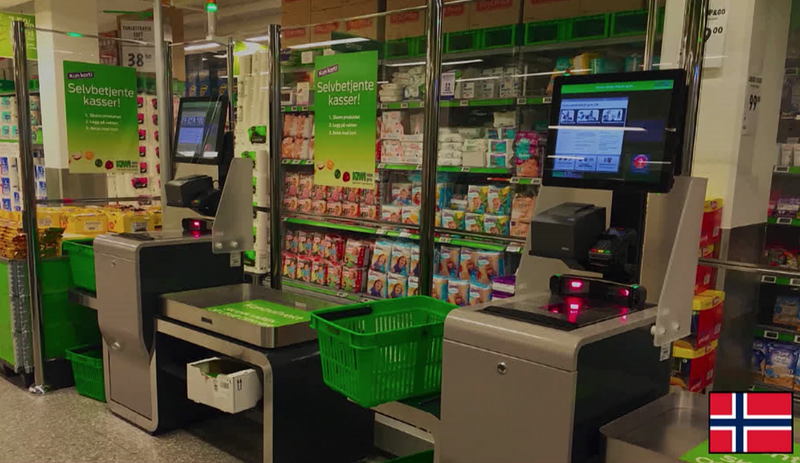 In Norway tollbooth operator, supermarket packers and a restroom janitor would earn almost three times as much as in the US. And that’s why we have replaced these people with machines. And that is why I was surprised when I saw an article in The New York Times in 2014 titled “preparing for chip and PIN cards in the United States”, because in the United States people are still using paper checks as a method of payment while Scandinavian banks have made us start using chip and PIN cards long ago, because the minimum wages here are so high. So Scandinavian banks can’t afford having people manually controlling the checks. So Scandinavian companies, because of the unions pressing up the wages, they had to downsize and introduce new technology or else they will go broke. And new technology increases the productivity in a society which in the long run also increases profit. And on the upper end of the wage ladder, in the name of solidarity, Scandinavian unions hold back the highest salaries of the skilled workers. 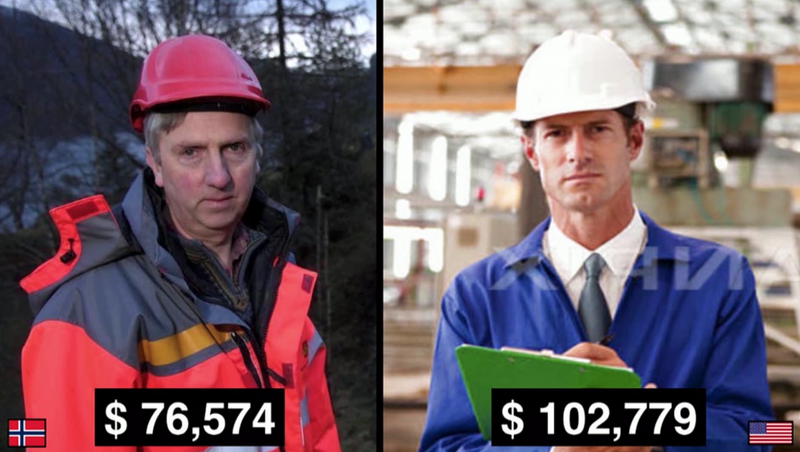 So, for example, a Norwegian senior engineer earns on average per year $76,000, while his American colleague earns more than $100,000. So American engineers — they are not only better good-looking but they are more expensive. So the unions are in effect subsidizing the capitalists. I wish I knew all this when I gave up a career in social science because the beauty and the irony of this finding, I think, is amazing. On the one hand, you have my rich informants that complain about how hard it is to get rich in Scandinavia and they had it all wrong. Not only is it easier to get rich in a social democracy but they are critical to the very institutions that have helped them getting rich: high taxes, which gives free education and more talent into the economy, strong unions that are helping increasing the productivity, and the generous welfare state that make the unions accept downsizing because they know that their members will be well taken care of, so the unions cooperate because of the safety net. So rich people are a bit like Immanuel Kant’s famous bird who thinks she could fly even faster in air-less space, forgetting that it’s the air itself that gives her lift. And on the other part of the political spectrum when Bernie Sanders is praising Scandinavian societies, he forgets that these are not anti-rich or anti-capitalist systems, because the welfare state and unions work in tandem with capitalist dynamics. And I think that is the most important lesson here. The economy is not a zero-sum game. We’re in this together, and that is why Scandinavia is a better place to fulfill the American dream. Thank you so much. This entry was posted in Dubious statistics, Economic fundamentals, Free markets and their discontents, Guest Post, Income disparity, Social policy, Social values, The destruction of the middle class on August 14, 2018 by Yves Smith. Well, that was entertaining. 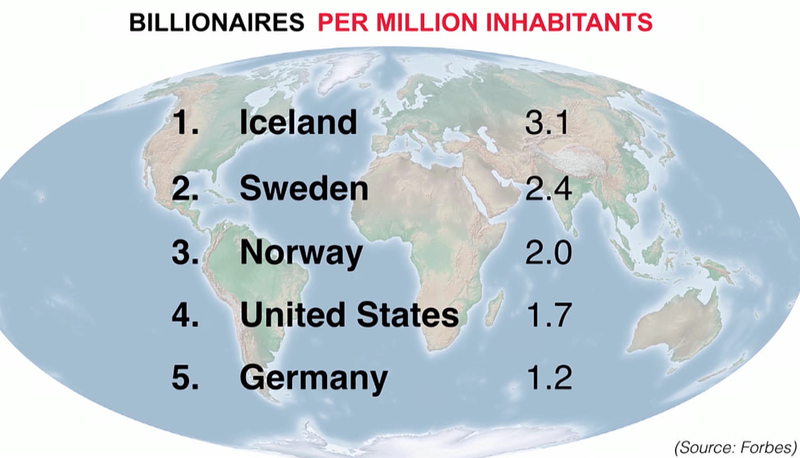 I certainly didn’t know there were more billionaires pp in Scandinavia than in the US. I’ve no personal knowledge of Scandanavian unions, but from my experience of the engineering sector around the world there are a number of different dynamics at work here. One is that yes, US engineers are often paid more, but they are far more likely to be on short term contracts and to move employer more frequently. European engineers are far more likely to be fully pensioned ‘lifers’ in a company – so the gross earnings over a full lifetime may be more similar. Another factor here is that the downgrading of professional roles by Unions has a lot more to do with the dynamics of Union organising than a desire for ‘solidarity’. In my experience of Unions, big, broad based Unions often quite deliberately sideline their professional and technical members in favour of those in unskilled and managerial grades, simply because the latter outvote the smaller numbers of professionals. Engineers and other technical workers face a choice – either form small, specialist Unions representing their roles, and risk having that union sidelined by the bigger general unions, or join the big general union (with all the bargaining power this entails), while risking getting marginalised within the Union. So I suspect the relatively low pay for specialist engineers in the Nordic countries may well have more to do with the dynamics of Union organising than a true desire for solidarity. They may simply be outvoted by their managerial and unskilled colleagues. Scandinavian countries probably have a lower cost of living, in which case their salaries go farther. Free college and health care will make a difference. I came across this in France in the mid 1970’s to 80’s. White collar workers in particular, but I don’t think limited to them, made less than their US counter part until you factored in 6 weeks of vacation, truly excellent free health care, relatively low transportation costs, and a host of other benefits. Even considering their high taxes, they were making out like bandits and enjoying their gains to boot. The observations about such policies making wealth opportunities more equally distributed and general business and technical acumen of higher quality due to a more legitimate meritocracy seems rational enough but I had no way of judging. I had some reservations about education based on fierce academic competition (French system and European countries in general) though I assumed, somewhat naively, that it was better than what the US had – except that bck then education was relatively cheap and more accessible to all in the US which tended to help those get a leg up who didn’t have the non monetary inheritance of stimulating childhoods, education and culture, such as was more readily available to the class of French fonctionnaires than to, say, the average waiter in a restaurant, or a checkout cashier in a supermarket. But this was all rather vague; what quality of education in the US, what real accessibility, and so on, so at the end of the day, I would have chosen the French system over ours though it struck me there might be some way of making a hybrid. Their taxes certainly provide a more robust social safety net, a species that is fast becoming extinct in the West. Imagine how that safety net releases people to worry about other things than mere survival, makes for a healthier life/work balance, increases access to health care and education. Those taxes subsidize public transportation, which is treated as a public good rather than an enemy of private enterprise. It subsidizes employers and employees alike, and improves the environment. Little wonder the Netherlands and Scandinavia rank so much higher on happiness indices, which are indirect measurements of the above. The straigh salary comparison doesn’t take into account other benefits – longer vacations, retirement pay, etc. in Scandinavia. If this is true the U.S. might be the country which requires the least work to be rich. The corporate welfare can’t hurt. American Engineers are highly regulated, just like American Doctors – so much so that impostors will be arrested (some have been imprisoned in fact) if they call themselves an ‘Engineer’ without being registered within their state of practice. Having worked overseas for many years this is not the case in most countries of Europe. In my view this is the main reason for the higher salaries – nothing to do with socialist vs capitalist or trade unions. In the UK anyone can call themselves a Civil Engineer, it means nothing over here. I believe you are describing USA “Professional Engineers”, who, in my experience, are civil engineers or electrical engineers designing electrical grid infrastructure or power distribution systems in buildings. If one went to Silicon Valley, you’d find many Electronics/Electrical/Mechanical Engineers who are not “Professional Engineers” but have college degrees in electrical engineering/mechanical engineering. Then go to https://www.bls.gov/careeroutlook/2018/article/engineers.htm and find that the BLS lists the employment of USA “engineers” at 1,681,000 or about twice the total number of PE licenses (which per the above quote may have some double counting inflating the number). I work in the electronics industry with many people who identify themselves as electrical engineers, but not many are in the regulated “Professional Engineers” category. Yes. I am a Registered Professional Engineer. But no matter the field of engineering, one is breaking state law if, for example, the business card, signature or other designation states that one is an Engineer when not actually licensed. People have been sent to prison for doing so. It is a very serious offence. Where I work we have various engineering titles such as Product Marketing Engineers, Software Engineers, Development Engineers, Test Engineers, Manufacturing Engineers, Production Engineers and Materials Engineers (and probably a few titles I forgot). I believe the business cards state this fact. I also believe relatively few are registered Professional Engineers. Per my reading of your post, I am surrounded by many who are breaking state law via their business cards. Yes. If they place themselves in a position where a complaint to a State DPR were to be lodged, they could find themselves in quite serious trouble. in Illinois, probably not, as they are not performing ‘Acts Constituting the Practice of Professional Engineering Pursuant to Section 4 of the Act’. If you are signing ‘technical submissions’ of blueprints and construction documents, you would be in trouble in Illinois. The term “technical submissions” is defined by the Board as including, but not limited to, documents submitted for approval to any authority having jurisdiction, and means designs, drawings and specifications that establish the standards of quality for materials, workmanship and equipment and the construction systems, studies and other technical reports prepared in the course of a design professional’s practice. A design/build entity shall not offer to provide or provide professional engineering services, unless the design/build entity is an Illinois licensed professional engineer or professional design firm. Offering to provide professional engineering services shall include, but shall not necessarily be limited to, any tender of engineering services either independently or in combination with construction services by any sign, card, advertisement or other device that might indicate to the public that the entity is entitled to provide engineering services. Still a goof idea to not use ‘engineer’ unless you are one. There is also the scenario, for example, where they attend a meeting with a client where a Registered Engineer is also present, and they are observed representing themselves as an Engineer to the client and offering advice and recommendations of an engineering nature. Just representing themselves as an Engineer in this scenario is enough for a complaint, but if also offering advice they could see jail time, as you say, depending upon the state. Well I have an engineering degree and I work at an engineering company designing things and making engineering documents that go out for people to build stuff, and my card says “Senior Engineer.” But I’m not a PE nor am I officially licensed in any other way, although I do have some relevant industry certifications that are to be honest nothing like a PE. There are some PEs in the office who stamp drawings and the rest of us don’t. Nobody is going to haul me off to jail. But I’d make more money as a PE. This is from 2012 and it details criminal actions against people in California who were found to be violating the “Professional Engineer” requirement. Nine actions from 1996 to 2003 or 9 in 8 years in the most populous state in the USA.. This is akin to impersonating a doctor. It is important is to not represent oneself as a professional engineer and stamp documents when one is not a professional engineer. I believe a lot of USA working “engineers” can still call themselves engineers, as long as they don’t refer to themselves as “Professional Engineers”, with little fear of going to jail.. The Engineering Consulancy where I spent my formative years, at the time one of the largest in the USA but since acquired by Jacobs, would not permit even the use of Engineer unless one had passed the first examination of the PE licensure procedure. At that stage one would be designated ‘Staff Engineer’. Then upon completion of the 4 year internship, and after passing the second 8 hour practical exam, the title ‘Project Engineer’ could be used. However, further training, portfolio approval, further internal exams and a half day oral examination by three Corporate Consultants + CEO at the Corporate headquarters was required before one could be designated ‘Senior Engineer’. This was a serious business. In my case, the previous three candidates did not pass their oral examination. A quibble: “Because unions” (pressing up wages) is as convincing as “because markets”. Many unions in many countries endeavour to do this, but their labor markets are over-supplied relative to demand to achieve Norwegian rates. My view. Norwegians have benefited from nordic prudence, high-trust cultural homogeneity, oil-lots of it relative to population, oil – well managed to provide income to Norwegian labor and capital, oil- a lot of oil income being saved, oil-limited dilution through population growth, limited damage to public balance sheet through privatisations/sale of infra to foreigners or debt. Education institutions appear focused on locals and on education, not profits or employee salaries. Much of the country has little litter, graffiti or other vandalism, young women staff convenience store checkouts alone at night – and not from behind bars, In the north florists leave stock on the street while closed Sunday. These security conditions lower costs, and increase productivity, and are an important part of freedom. While the author presents a refreshing argument, the standard reply to the Scandinavian capitalist model is that it cannot be successfully replicated in larger, more ethnically diverse societies. I would tend to agree with that assessment just on the personal experience that people tend to restrict their social interactions on similar cultural background. This cultural immersion leads to regional affiliations. These separate communities then compete for resources and political power. This presents a very complex political environment in which policy is decided. Strictly under a capitalist system, a more even distribution is possible in a society ethnically and culturally uniform. With the emphasis on cultural unity, economic inequality can take second priority in the overall system and a rich elite seeking to disrupt that social harmony would face greater restrictive pressures. The current tariff and immigration disputes seem to bring this dilemma to the fore. Capitalism that works for a broad society requires a degree of social protections and isolationism – and external markets. From a competitive, exploitative capitalist perspective, that is impossible in diverse societies. One group can always be played against another for individual gain- if not checked in some manner, or the society consumes itself in the process. This dynamic makes America weaker by the day. Fighting for capitalism is the glue that holds the country together. Social harmony has never been a goal of the American people, only equal opportunity and treatment to compete in the capitalist order. This seems like a contradiction- fighting for an economic system that leads to disunity. Social harmony should be the goal, and the unique forms that result from that achievement will vary from place to place. Capitalism does not work everywhere. Capitalism does not work everywhere. I both agree and disagree. There is readily observable evidence that culture can advance or retard economic success. Most Islamic countries enjoy huge wealth disparity, and were it not for exploitable (by the West) natural resources, they would still be getting around on donkey’s and camels. Oh, they still do? On the other hand, the cultures of Japan and South Korea embraced hard work and self-improvement, and despite limited natural resources, are an economic success. But then there are subcultures, and therein lies a wildcard. In the US, it is not so uncommon to have neighborhoods of people who sour-grapes education and even upward mobility. This is often reflected by remarks from noncommissioned officers: “Don’t you call me sir! I work for a living.” Several of my friends over the years came from such backgrounds, often getting terminal degrees in their late 30s or early 40s. When asked what caused them to change course, they always had an immediate story of their epiphany. Similarly some western subcultures discourage homework, shrug off playing hooky from school, and encourage their offspring to pursue the same occupation as their fathers. When your father is Fred Trump, that is not a problem. When your father is Fred the mechanic, it discourages upward mobility. And often in Japan and South Korea they are over-working themselves to death, to which we could all ask what for? Why do we all go along with a system, whatever it calls itself? What is demanded, for example, in Capitalism is an unequal society, so that some can ‘work’, always meritoriously of course (since that is always claimed) to get more than others. Capitalism requires this inequality, it creates it, and Capitalism reinforces itself. It wouldn’t be much of a ‘system’ if it didn’t. We want it, so that’s what we produce and get. The conscience of a Viking is an extraordinary competitive advantage. They are not restricted to Norway. Supposedly the Normans and the Russ started out as Vikings. The American Dream underwent a fundamental redefinition during this aging Boomer’s lifetime. When I was young, the phrase indicated that the American system was supposedly set up for the average person, so that if one worked hard and lived responsibly one could count on enjoying a decent and rewarding life. That dream was unifying. Then in or around the 1980s/90s, the American Dream began to refer to something quite different: the opportunity to become extremely rich whatever the cost. That dream was divisive. In the former American Dream, George Bailey was the good guy, Mr. Potter the bad. In the latter, the roles were reversed and voila…there sits the likes of Trump in the Oval Office. You are right about that. I disappeared overseas from America for a few years in the late 70’s. When I moved back in the mid 80’s I was shocked to see the rise and prevalence of ‘Gated Communities’. To me this was the antithesis of everything I believed America stood for – something wrong with society when this becomes desirable. Spot the odd one out. 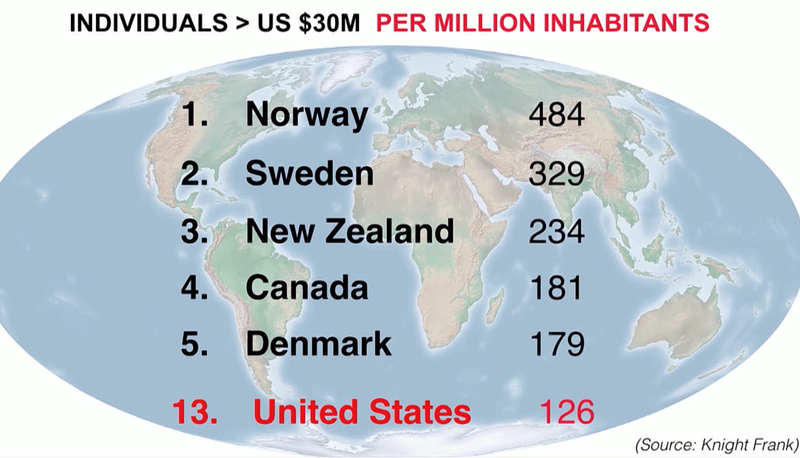 Four of the five “$30M” are rich countries. In contrast to the title of the story “Where in the World Is It Easiest to Get Rich?” I suspect that a large proportion of the wealth of New Zealand’s obscenely rich is exogenous. Because it’s a nice place to live for a multi-millionaire, and not an especially good place to make money. Because in terms of wages and social mobility, these days NZ is closer to the US than to Scandinavia. This post uses the count of millionaires and billionaires per capita as a proxy measure of the relative with which an individual might grow rich. As you point out, this measure ignores ‘where’ the wealth originates. This measure also ignores the ‘how’. Besides, it ignores class structures which might skew the measure. A society with a very large number of slaves and a very small class situated to become wealthy would obscure the ease with which members of the fortunate class might become millionaires and billionaires. Digression: the Scandinavian engineer looks like an engineer whereas the American engineer looks like a model. Reality vs. perception. Reality: the American dream hasn’t been working out so well, for many people, for a very long time now. But Scandinavia is a very nice place to be. I agree, “because unions” is awfully reductive. But they are part of it. Another key part is taxing away much concentration at the top which simultaneously discourages avarice while encouraging reinvestment, something all but extinct in the US. Maintaining high wages maintains high demand, encouraging investment creates new wealth, it’s a virtuous circle that leads to a society that doesn’t treat most people like criminals, which is now the default setting in the US (just try to get on a plane without being treated like a criminal). Turns out when you don’t treat people like dirt, they don’t act like it and you get less litter, graffiti, vandalism and petty crime. Also, these societies see housing, diet and health as rights, not luxuries, and see to it they can be had at reasonable costs. The racist elites in this country regard life itself as a luxury. Despite the political right’s use of the phrase “right to life”. There is no right to life in the US, just as there is no democracy. The ruling class in this country is genocidal. Look at their solution to every problem on the world stage, bomb it to oblivion, ethnic cleansing. Likewise domestically; mass incarceration is genocide; lack of housing is genocide. Lack of medical care is genocide. These have been the policies of our ruling class. With the advent of automation the ruling class just wants everyone else to go away, except for those select few that serve their needs. The only medical care the elites contemplate are ample supplies of oxycontin. This isn’t Kansas anymore, this is the Weimar Republic. Hmm, I hear you. Whenever I hear people talking about ‘the problems of t’day’ I often think that they think that people just evaporate. What do I mean? So I’m talking to this guy. He is ‘high up’ in a local industrial plant. He thinks the people under him are mostly stupid and lazy, or useless, or some combination of all three. They should all just be ‘sent away’; they are too stupid to work there. Sent away to where? I always think. To the unemployment benefits office? Where we all have to pay more for their welfare, so they can live, so we don’t have to step over dead bodies in the street, on the way to work or the shops? Like most who make arguments of this kind, he thinks that people just evaporate. You just send them away and ‘poooof’, they disappear and cease being a problem. Months later, at one point, and since the plant is linked to (open-cut) mining in the area, he talked about having this large hole in the ground available to drop all the dead bodies of useless people into. His reasoning for the social problems of t’day therefore involve having people being disappeared: sometimes purely magical, and sometimes purely murder. He is not serious about casually mentioning the mass murders, of course. I mention it because he is an otherwise intelligent person, and because this thinking is so destructive and so common. Make some statement on an important topic and minds turn to mush. It is assumed as the starting point for any reasoning that others are dishonest and or stupid. My friend also thinks the people above him in the company structure/society generally are complete idiots who should be made to go away. These are the ingredients, and we have the recipe for a divided and unequal society of humans. To the question of where . . . prison. The purpose of mass incarceration, primarily control and exploitation of surplus workers of color, is easily expanded to encompass additional surplus workers of any race. Police militarization, the deification narrative increasingly pushed about “first responders” and LEOs by the political and business classes, prison privatization, and criminalization of much of the working class’ daily activities (loitering, homelessness and car living, drug and alcohol abuse in public, the return of debtors’ prisons) all point to greater imprisonment as the preferred response to increasing unemployment, the “skills gap,” and AI and automation of both manual labor and basic information economy tasks that previously required humans. Unfortunately inequality is rising in the Nordic nations too and their social democracy is under assault. I agree with Norb above in the comments on diverse societies – trust does seem to be lower. An example of a society with a very strong level of social cohesion outside of the West might be Japan. Research has found that in the US, the percent of African Americans is negatively correlated with the generosity of the welfare state. This is hypothesized to be caused by whites not being willing to spend on people they do not sympathize with. It is interesting to see that the refugee influx has led to a backlash in the Nordic nations too. Probably so far the only nation that has not seen this level of backlash this far is Canada, although the election of Doug Ford in Ontario may be signs that is changing. In the US, children born to parents in the bottom fifth of the income distribution have a 7.5% chance of reaching the top fifth, according to Stanford’s Raj Chetty, the paper’s author. For the UK, that figure is 9%, while Danish children at the lower rung of the income ladder have an 11.7% chance of climbing to the top. In Canada the figure goes as high as 13.5%. Keep in mind this paper was published more recently than the data from the article and that 20 percent is a perfect score. I do have a hypothesis about why Canada, although it does have a high immigrant population has avoided the worst effects. The Canadian immigration system has been very selective on who it accepts. Immigrants to Canada have lower rates of crime than Canadian born citizens and if I recall correctly tend to pay more over the long run in taxed into the system (let’s ignore MMT for a moment on this one), so the perception of immigrants as leeches does not have as much effect. A final reason is that despite being a neoliberal, Justin Trudeau has avoided austerity in Canada thus far. Let’s hope that holds. I do have one quibble with the article. Wall Street frequently urges corporate executives to cut wages and treat workers like crap. They have made this into a zero sum game. For my part, Costco has become my largest source of groceries becuase they seem to be treating their workers the best of the bunch, which isn’t saying much. Unfortunately the rich see us as just peons to extract wealth from. They would rather have a big slice of a smaller pie than one larger and growing more quickly. Honest statistics can be very nice. Does anybody have a knot in their stomach about this? Maybe monopolists; maybe offshore pirates; maybe corrupt pols. I think we could all do with a daily dose of this kind of sanity. Thanks. My friend who we had hired to design a way of creating a waterfall in a studio made sure to define himself as a designer, & not an engineer. In Hollywood there are Grips who are essentially doing engineering on demand. There are Union rules that influence their officially recognized positions. Demonstrated mastery counts. For producers hiring talent worth millions, set safety is a priority. It is the same in NYC, though the Grips in LA have the opportunity to work on more dangerous jobs seen in features. NYC is more about commercials. I ought not forget Las Vegas. This is not to say there are different considerations. Professionals are safer and they are either certified by Unions or by Government Certifications, quickly seen in FAA piloting requirements. The US of 1942 to 1970 was run by men born in the 20s whose Generals were born in the 19th Century. (Best working years are 35 to 55, not rich by 50 not going to be.) US wealth was a direct result of the GI Bill. If the GI Bill had been won for all of US society there would be a greater desire of immigrants to assimilate. Homogenous societies experience less social friction. The US had an artificial homogeneity as it offered greater food security for the Irish. Hunger drove more nationalities to immigrate than the Irish to come to the US, but the Irish immigration was the result of being starved, and is a very basic reason for moving. Youth in the US ought be shopping for nations to move to over colleges to go to in my judgement. Better to go to some safe civilized place where one may get a university or trade eduction and have a civil private life, than be all eat up by desperation as are the majority now in the US. The ideal nation is a country, company & work of art. I didn’t notice The Netherlands as producing the sort of rich person appearing in the bar graph statistics. Still I’ve known them to have received excellent educations that make them desirable citizens all over the world. Rich as just about possessions may mean desperation and a life of fear when nobody really cares if you get robbed or kidnapped which is what great inequality means if you consider “gated” communities as evidence. P.S. Desperation does apparently inspire great art and the art that is film is related to the desperate attempt to overcome through unconventional means & merit. The Meritocracy in the US is still working in the arts and in sports. “Breathless” is probably my favorite French movie. The author used humor beautifully along side actual statistics to make his point in a particularly friendly and thus novel way. What that cost him, to a degree at least, is a more accurate portrayal of the brutality and ruthlessness of the purely neo-liberal economies and their respective global industries, financial sectors, banking, political and judicial policies, etc., in locking down avenues of access to creative and innovative as well as lucrative places within the system to those people from lower economic backgrounds..
Gated communities are but a small reflection of this deeply nefarious world outlook in action. ‘The women are either very skinny or box shaped’. ‘It’s nearly impossible to find vegetables’. ‘A pizza is twenty dollars’. ‘I was shocked the first time I walked down the street and saw these well dressed women drunk, lying in the ditch. That turned out to be pretty common’. By the time she finished, I decided to buckle down and stay in the US. Another guy, who had just returned from a semester in Italy, got his money back and repeated that semester in the US. The quality of education, he said, was terrible. Don’t think we’re comparing apples and apples when we talk about free education, or any other social good. Average quality of public education in the US is very mediocre at best these days. The US still has some of the best private schools and universities though in terms of performance, but from my experiences compared to Canada and the rest of the world, the average quality of American school or post-secondary education is in relative decline. Consumer goods are however cheaper in the US no doubt, and the selection is better, but for the middle class elsewhere, they have made relative gains. There are other examples. Car ownership is cheaper in America, but in many other places, mass transit is good enough for you that you don’t need a car. Perhaps only in NYC do you truly not need a car and NYC is expensive. Quality of infrastructure is also better elsewhere. The US has lost ground on costs like healthcare and as a result, Americans pay more than the rest of the world, but live shorter life expectancies. The US is also falling behind on other quality of life areas, such as poor work life balance. Americans work longer hours and on average, take far less vacation. Maybe for the richest 10 percent of people, America does have a leg up in some regards, but for most people, their loved would overall be better abroad. I think the explanation is flawed. Norway, Sweden, New Zealand and Canada have 0% estate tax. Denmark has 15%. US has 40%. So one must ask, is it good to have a lot of 30+ millionaires if most of them received their money through inheritance? The stats would be more meaningful if they used the range below 11.2 million (The US exemption). The way Canada treats the estate transfer, the recipient pays capital gains on all of their gains. So voila… estate tax. Bigger question still: do we want any billionaires at all? Norway has more start ups and entrepreneurs than the US per head of population. The welfare safety net means that nearly all the population can take risks and have something to fall back on if they fail. The repayments on student loans have been another nail in the coffin for US entrepreneurs as the repayments mean they can’t take risks. This is why they all seem to go to Harvard, as they have rich parents to fall back on should they fail. Read “Viking Economics” to see how they do it.